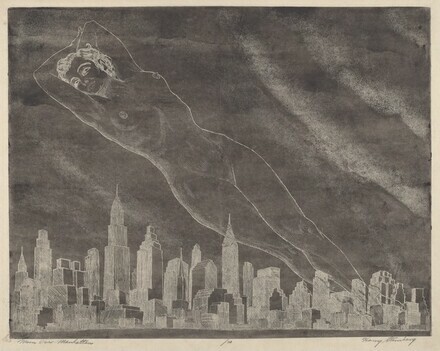 lower left in graphite: Moon Over Manhattan; lower center in graphite: /20; lower right in graphite: Harry Sternberg; lower left edge in graphite by unknown hand: Edition 20 Price $10. Moore, James C. Harry Sternberg: A Catalog Raisonné of His Graphic Work. Wichita, Kansas: Ulrich Museum of Art, 1975, no. 94.